Spacious and modern style Wetherspoon’s pub in Aldgate, at the junction of Prescott Street and Mansell Street. The interior is light and airy with large picture windows on to the streets. I believe this used to be office space but was converted to a pub some time around 2000. Unfortunately the Goodman’s Field seems to have often suffered from poor management and the staff often appear ill-equipped to cope with the office crowds that descend on the on the pub at lunchtimes and after work. It can sometimes take ages to get served, and don’t expect the bar staff to understand any concept of serving people in turn. There are 10 handpumps on the bar but don’t get excited, there are never more than 5 working and it’s often only 2 or 3. Beer quality at the Goodman’s Field varies erratically – sometimes very good, sometimes poor. Once during one of the Wetherspoon’s beer festivals that had no real ale at all! . Unbelievably (in my view) this pub is in the 2011 Good Beer Guide, so someone must like it. 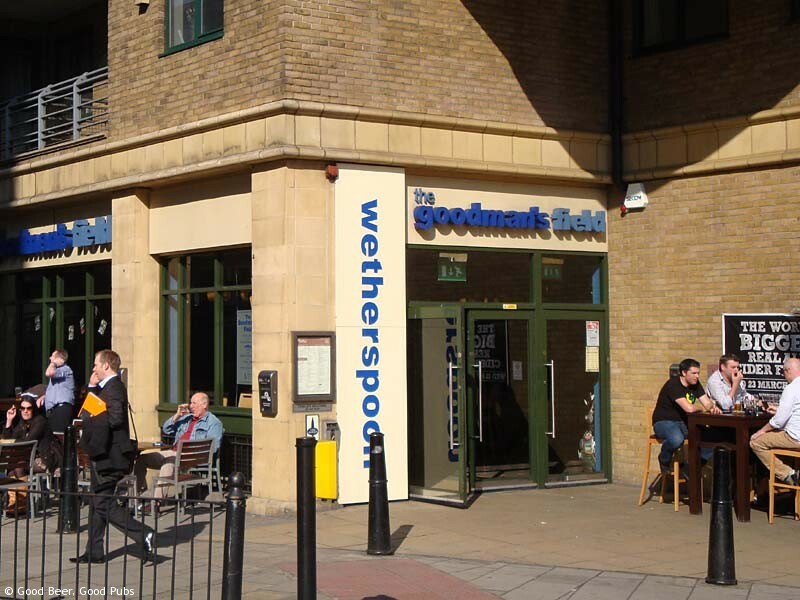 The food is the normal Wetherspoon’s selection, and it’s generally edible. I can’t recommend the Goodman’s Field at all really – I only used to frequent it as I worked very close. If you need a Wetherspoon’s in this area then head to the Liberty Bounds near Tower Hill tube station. Alternatively, the Brown Bear in Leman Street or the Peacock in Minories are probably the nearest good pubs.